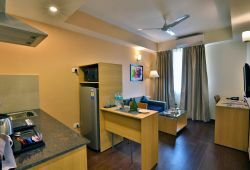 Serviced Apartments in Neemrana - Many Options! 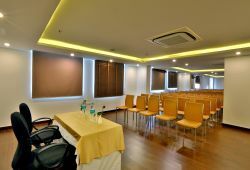 Ideal for formal Corporate meetings or for Social or Family functions. Central location in the heart of RICCO Industrial area. Close to Korean and Japanese commercial districts. 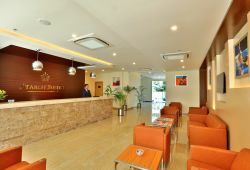 A multi cuisine restaurant with a bar lounge is located on the Lobby level of our property. Our Luxury Studio​ and ​One​ Bedroom Apartments have all modern amenities and fittings. Starlit Suites offers the best luxury service apartments and suites in Neemrana , and in the best locations of Neemrana. Our properties are located in the heart of the commercial district and RICCO Industrial area. 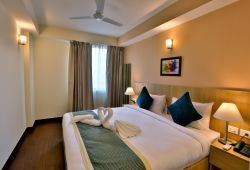 Our properties in Neemrana are tastefully decorated and built with comfort in mind, our spacious suites and serviced rooms in Neemrana are ideal for both short term as well as long term stay in Neemrana. Keeping in mind the working professionals and families we have a large lounge; adjoining the lobby where tea, coffee, juices and other small snacks are served throughout the day. We also have an in-house fully equipped gym cim fitness are which is equipped with modern fitness equipment and accessories to keep you fit and ready for your work trip or family holiday in Neemrana. Neemrana is an old historic town in Rajasthan, and is centrally located between Delhi and Jaipur at a distance of about approximately 120 kilometres from Delhi. A trip to Neemrana trip is certainly a must do for any traveller or tourist in India, as the city brags of a radiant tapestry, excellent picturesque hills and shrubs as well as a busting IT sector and manufacturing industry encompassing it. Neemrana is also soon become a manufacturing hub of India and several international and national organisations- including many fortune 500 companies have begun producing here, particularly in the Export Promotion Industrial Park (EPIP). While on a visit to Neemrana , tourists to Neemrana must visit the Neemrana Fort which is one of the most iconic and historic places in India. Perched on a high hillock, it gives a beautiful perspective of the land and the nearby geography. This historic stronghold has now been changed over into a resort and leisure space. The quiet and peaceful conditions add to the pleasure of the visitors who come here looking for a relaxing holiday in Rajasthan and a break from their hectic work life. Many people visit here for the famous Neemrana trek, a trek in Neemrana takes you to close-by places, and near by beautiful villages and landscapes. Neemrana serves as the ideal focal point for a trek to Rajasthan due to its central location. A few famous holiday places in Rajasthan , which are close to here are Vinay Vilas Mahal, Vijay Mandir Palace, Bhartrihari Temple, Bala Quila Fort, Sariska National Park and Siliserh Lake, all of these place are a short drive from Neemrace. Other than going to these spots, different things to do in Neemrana incorporate trekking or even enterprise sports like flying fox, as well as zip line in Neemrana. Neemrana is also a central travel hub and is connected with vital north Indian urban areas by rail, road as well as by Air - by virtue of being close to New Delhi . There is no Airport in Neemrana and the nearest is the IGI New Delhi Airport, and the closest railway station near Neemrana is in Alwar. Driving to Neemrana from New Delhi and Alwar by road is a short drive and can comfortably be covered in a few hours. It is also suggested to tourists to visit Neemrana in the winters as the temperatures are nice and chilly, and the cold winters can really be enjoyed thanks to the open breeze and surrounding hills.